Do you want your car steering wheel interior to look good all the times? Would you like your steering wheel to be comfortable and have a good grip? Are you tired of having your steering wheel look old and scratched? The Lebogner Car Steering Wheel Cover is the answer!!! Our Steering Wheel Cover will keep you car interior look new all the times. Be safe and feel comfortable with a good grip on the steering wheel while driving with this steering wheel cover. Made of top quality material that will be long lasting and look good forever. ★ Customized design to Fit Over Any Middle Size Wheel. ★ Top quality microfiber leather material which is harmless, durable and heat or cold resistant. ★ Ergonomic design and with massage effect that will increase the comfort and reduce driver fatigue. ★ Made with anti-slip inner material to increase safety when driving. ★ Steering wheel cover does not have a nasty toxic rubber smell. ★ Has a great grip on the steering wheel. ★ 100% NO HASSEL Lifetime Guarantee - NO RISK TO YOU! ★ Steering Wheel Cover installs easy and fast. Hurry! Keep Your Steering Wheel Look Good And Make Your Life Easier By Adding This Amazing Lebogner Car Steering Wheel Cover To Your Cart Today! ✓ Our Steering Wheel Cover is the perfect solution to keep your car looking good all the times. It's made with top quality microfiber leather material which is harmless, durable and heat or cold resistant. 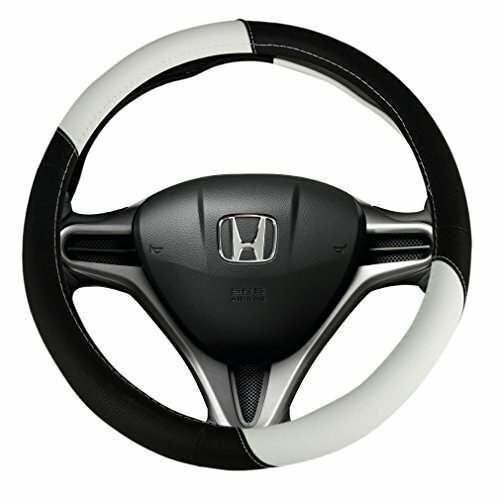 ✓ Our Steering Wheel Cover is stylish improves the appearance of your car's interior. It was produced with ergonomic design and with massage effect that will increase the comfort and reduce driver fatigue. ✓ Our Steering Wheel Cover is suitable for all middle standard size steering wheels with 14.5" inch to 5.2" inch diameter (37cm to 39cm). Please measure the steering wheel before purchasing. ✓ Our Steering Wheel Cover has a great grip on the steering wheel, also made with anti-slip inner material to increase safety when driving. The steering wheel cover does not have a nasty toxic rubber smell. ✓ Buy It Now With Confidence, This Best ★ TOP QUALITY STEERING WHEEL COVER ★ Will Keep Your Car Interior Look Good and We Guarantee Satisfaction With a 100% Lifetime Money Back Guarantee.